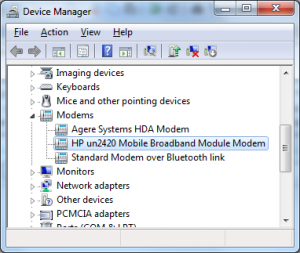 I have recently realized that my HP 8440p laptop has a built-in "Qualcomm un2420 Broadband Module" device, also known as a "3G modem". For some reason no drivers were preinstalled for it on my system, and with the SIM card slot concealed behind the battery, it was not something I noticed immediately. Once the drivers were installed, the operating system had no problem recognizing the new "Mobile Broadband Connection" opportunity, and with the SIM card in the slot, I could connect to the Internet via 3G, yay. Knowing that there is more to mobile communication than Internet access, I was wondering whether I could do anything else, like voice calls or SMS. Unfortunately, my attempts of finding any reasonable software packages, which would open up the power of 3G to me at the click of a button, failed. Instead, however, I discovered that it is actually quite easy to communicate with the modem directly. It turns out you can control your shiny bleeding-edge 3.5G device by sending plain old AT commands to it over a serial port. This is the same protocol that the wired grandpa-modems have been speaking since the 70s and it is fun to see this language was kept along all the way into the wireless century. Let me show you how it works. Try to follow along — this is kinda fun. 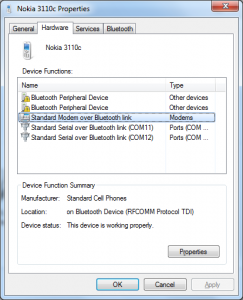 Switch on the Bluetooth receiver on your phone (for older Nokias this is usually in the "Settings -> Connectivity -> Bluetooth" menu). On your computer, go to "Devices and Printers", click "Add a device", wait until your phone appears on the list, double click it and follow the instructions to establish the connection. (I'm talking about Windows 7 here, but the procedure should be similar for most modern OSs). Once the computer recognizes your phone and installs the necessary drivers, it will appear as an icon in the "Devices" window. 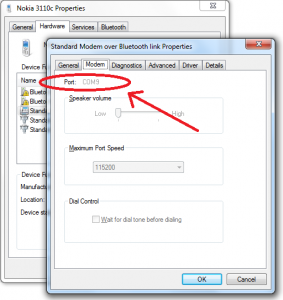 Double click it to open the "Properties" window, and make sure there is a "Standard Modem over Bluetooth link" function or something similar in the list. Double-click that "modem" entry, a new properties window opens. Browse along in it, and find the COM port number that was assigned to the modem. If you do have a 3G modem bundled with your laptop (and you have the drivers installed), open the Device manager ("Control Panel -> Device Manager"), find the modem in the list, double click to open the "Properties" page, and browse to the "Modem" tab to find the COM port number. Next thing - connect to the COM port. In Windows use PuTTY to do it. In Linux use minicom. Don't worry about the settings — the defaults should do. Once the connection starts, you will get a blank screen with nothing but a cursor. Try typing "AT+CGMI" followed by a <RETURN>. Note that, depending on the settings of your device and the terminal program, you might not see your letters being typed. If so, you will have to reconfigure the terminal (enable "local echo"). But for now, just type the command. You should get the name of the manufacturer in response. You can also get the word "ERROR" instead. This means that your modem is ready to talk to you, but it either does not support the "AT+CGMI" command OR requires you to enter the PIN code first. We'll get to it in a second. If you get no response at all, you must have connected to the wrong COM port. You can get more information about the device using the "AT+CGMM", "AT+CGMR", "AT+CGSN" commands. Try those. To do anything useful, you need to authenticate yourself by entering the PIN (if you use your cellphone over bluetooth, you most probably already entered it and no additional authentication is needed). 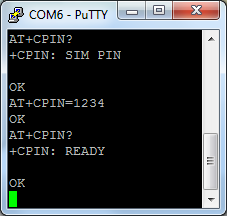 You can check whether you need to enter PIN by using the command "AT+CPIN?" (note the question mark). If the response is "+CPIN: READY", your SIM card is already unlocked. Otherwise the response will probably be "+CPIN: SIM PIN", indicating that a PIN is expected to unlock the card. You enter the pin using the "AT+CPIN=<your pin>" command. Please note, that if you enter incorrect PIN three times, YOUR SIM CARD WILL BE BLOCKED (and you will have to go fetch your PUK code to unblock it), so be careful here. Now the fun starts: you can try dialing, sending and receiving messages and do whatever the device lets you do. The (nonexhaustive) list of most interesting commands is available here. Not all of them will be supported by your device, though. For example, I found out that the laptop's 3G modem won't let me dial numbers, whilst this was not a problem for a cellphone connected over bluetooth (try the command "ATD<your number>;" (e.g. "ATD5550010;")). On the other hand, the 3G modem lets me list received messages using the "AT+CMGL" command, while the phone refused to do it. One useful command to know about is "AT+CUSD", which lets you send USSD messages (those "*1337#" codes) to the mobile service provider. For example, the prepaid SIM card I bought for my computer allows to buy a "daily internet ticket" (unlimited high-speed internet for 12 hours for 1 euro) via the "*135*78#" code. Here's how this can be done via terminal. We first send "AT+CUSD=1,*135*78#" command, which is equivalent to dialing "*135*78#" on the phone. The modem immediately shows us the operator's response ("You will shortly receive an SMS with information..."). 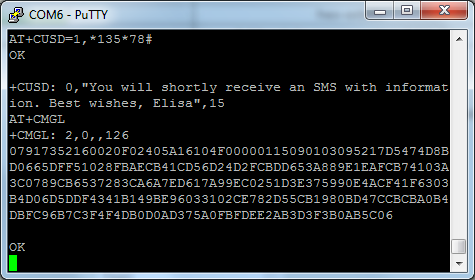 We then list new SMS messages using the "AT+CMGL" command. There is one message, which is presented to us in the PDU encoding. A short visit to the online PDU decoder lets us decrypt the message - it simply says that the ticket is activated. Nice. Finally, here's how you can send a "flash" SMS (i.e. the one which does not get saved at the receiver's phone by default and can thus easily confuse people. Try sending one of those at night - good fun). We start with an ATZ to reset the modem, just in case. Then we set message format to "text mode" using the "AT+CMGF=1" command (the alternative default is the "PDU mode", in which we would have to type SMS messages encoded in PDU). Then we set message parameters using the "AT+CSMP" command (the last 16 is responsible for the message being 'flash'). 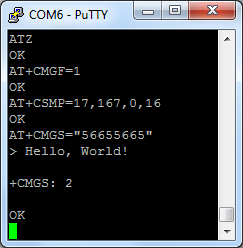 Finally, we start sending the message using the "AT+CMGS=<phone number>" command. We finish typing the message using <Ctrl+Z> and off it goes. For more details, refer to this tutorial or the corresponding specifications. All in all, it should be fairly easy to make a simple end-user interface for operating the 3G modem, it is strange that there is not much free software available which could provide this functionality. If you find one or decide to make one yourself, tell me.